Yesterday thousands of junior doctors for the NHS participated in a strike that sparked huge controversy on social media. In their thousands people took to their social media accounts to voice their opinions. The 24 hour strike was only the first, the next proposed strike begins on the 26th of January and is planned to last 48 hours. It has been estimated that Tuesday’s strike caused an estimated 3,300 operations to be cancelled, making that figure every one in ten operations planned yesterday. Not including the several hundred others that were also postponed around the strike. A massive 55,000 junior doctors work in England at the present time, of that 37,000 are members of the BMA. 26,000 were due to work on Tuesday and of that around 10,000 went to work. Those who went to work were said to be the doctors staying to help provide emergency care. Those are the facts, the figures are shocking but behind the statistics and numbers are actual people. People who work for the NHS to save lives and provide health care for our families instead of being able to go home to their own. The dispute, for those who are currently in the dark to the actual cause for this controversy, is a row between junior doctors and the government over a new contract. Talks of the new contract began in the summer of last year, however since then the row has escalated. Though the ministers offered doctors an 11% rise on last years basic pay this was counterbalanced by other elements of the contract. Ministers maintained there is no ‘extra money’ for junior doctor pay including unsociable hours. The government have argued explaining the new contract changes are necessary to be able to provide for the public more ‘seven day services’. The BMA – The British Medical Association is the professional body for doctors in the UK – has warned of excessive hours and concerns over weekend pay and career progression. Striking is always a last resort, but it was one the junior doctors were forced to take. Social networking sites voiced the wave of support from seemingly a vast majority of the public. People took to Instagram to load photos, hash-tagging #JuniorDoctorsStrike on Twitter and attacking their keyboard to join the argument. Dr. Neli Hallows took to her blog which has been posted on the official BMA website (www.bma.org.uk) to share her own experience of the day saying that: ‘grandparents were bringing hot coffee on the freezing picket line’ and that ‘so many honks of support from passers-by the noise was nearly deafening’. Though obviously the support wasn’t unanimous a massive 66% polled in favour of the action by ISPOS MORI on the morning of the action yesterday. Stalls across the country were set up so leaflets could be handed out to explain the reason behind the strike and stories of why the action was necessary. 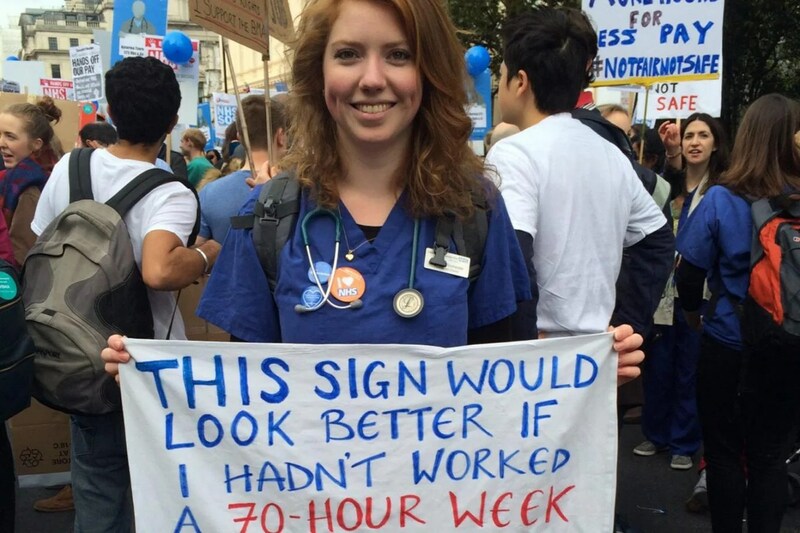 Over working and under appreciating our junior doctors is not something they or the public will accept. Tired doctors make mistakes. But, also, doctors deserve a life too. A good life and good pay. Over worked and under valued but standing up for themselves with the over-whelming support of the people who’s lives depend on them. Roaccutane: my journey: it can change a life or end one.